One question that many English fans have asked – Why is Germany so good at football ? The answer obviously cannot be down to one man but if it could that man would undoubtedly be Franz Beckenbauer. Beckenbauer is generally acclaimed as the greatest ever German footballer and is the only man to have won the World Cup both as a captain and as a manager. He is also the only captain to win three European Cups all with Bayern Munich, the club that thrashed everyone last season to win the German League, Cup and Champions League. How does he do it ? Who knows but in the classic post match analysis most footballers would say you need skill and athletic prowess combined with desire to dig deep and work hard. 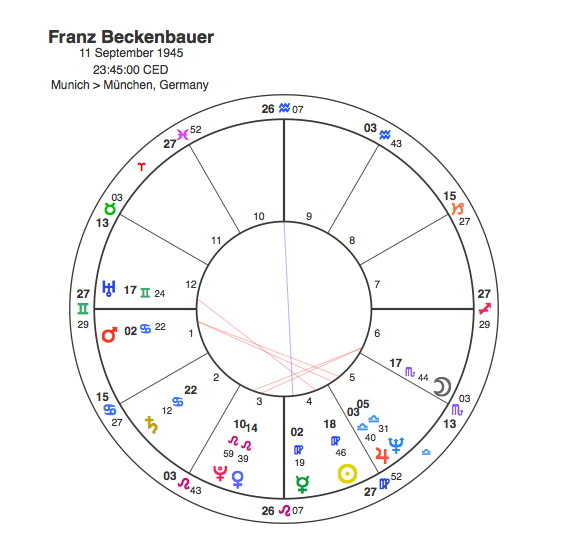 Skill in movement would be Gemini, athletic prowess probably comes from Mars, digging deep Scorpio and working hard certainly Virgo, so with Mars close to a Gemini Ascendant, Scorpio Moon and Virgo Sun, Beckenbauer certainly ticks all of the boxes. He also had some help from Pluto. So often Pluto’s conjunction to the Sun occurs when the subject makes the big breakthrough of their career. Pluto was on Beckenbauer’s Sun from 1965 to 67, he made his West German national team debut in 1965 and was ever present for the team that reached the World Cup Final in 1966. Pluto was square Beckenbauer’s Ascendant from 1969 – 71 and he captained his club, Bayern to the German League title in 1969. Pluto went on to square Mars ( always the most important planet after the Sun for any sportsman ) in 1972 when he led West Germany to win the European Championship and the planet returned close to the same aspect when he led them to win the World Cup and Bayern to win the European Cup in the summer of 1974. The peak of Beckenbauer’s managerial career was in 1990 when his German side won the World Cup. Naturally Pluto was conjunct his Scorpio Moon in 1990, Scorpio being a sign that is extremely good at managing other people’s skills and resources. Germany has won the World Cup, three times, Franz Beckenbauer was captain and then manager for two of them, they were finalists 8 times and he was there for 6 of them. Bayern Munich have won the European Cup five times in their history, Beckenbauer was central to each one, three of those victories as captain and the other two as club president. Pluto made aspects to his Sun, Moon, Mars and Ascendant for almost all of them. Perhaps Beckenbauer is the reason why Germany are so good at football and it’s just about skill, athletic prowess, hard work and digging deep after all, with a lot of help from Pluto of course.